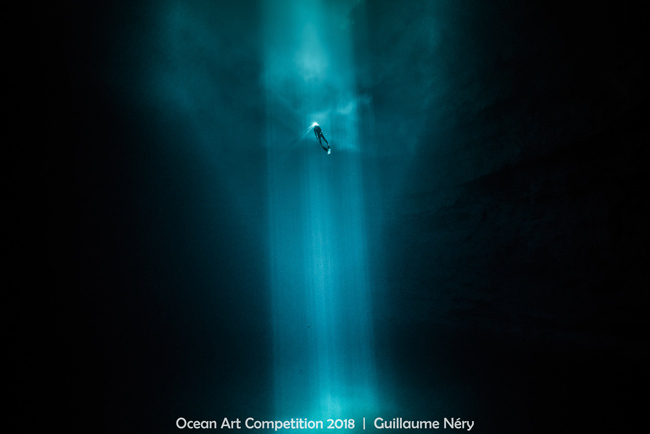 "Discovering the Hidden Face of Yucatan"
The Story: I shot this picture on breath hold, like all my underwater pictures. This one was one of the hardest to get. I had an underwater scooter to help me going down at around 20m deep in the Cenote, and then I went to the edge of the cave horizontally around 30m away from the ray of light. Then I waited the freediver Julien to come back up at the surface. I was lucky enough to press the button when the light of the sun reflect in his mask and add a bit of magic in this very special atmosphere. My goal was to use the cristal clear water of the cenotes to take this picture from as far as possible so that my subject is very small lost in the immensity of what looks like the cosmos.